NORTH CAROLINA 81, Marquette (Golden Eagles, 8,012 students, Milwaukee, WI) 63 – North Carolina’s length, athleticism and defense combined with Golden Eagles’ nerves translated into an insurmountable 40-15 halftime Tar Heel lead. Much has been made of North Carolina’s front line and again Harrison Barnes, John Henson and Tyler Zeller led the way behind the steady hand of freshmen point guard phenom Kendall Marshall. Like the 2009 NCAA Division 1 Men’s Basketball National Champions, this team is also driven by a Tyler. As Tyler goes, so goes this Elite Eight group of Tar Heels. 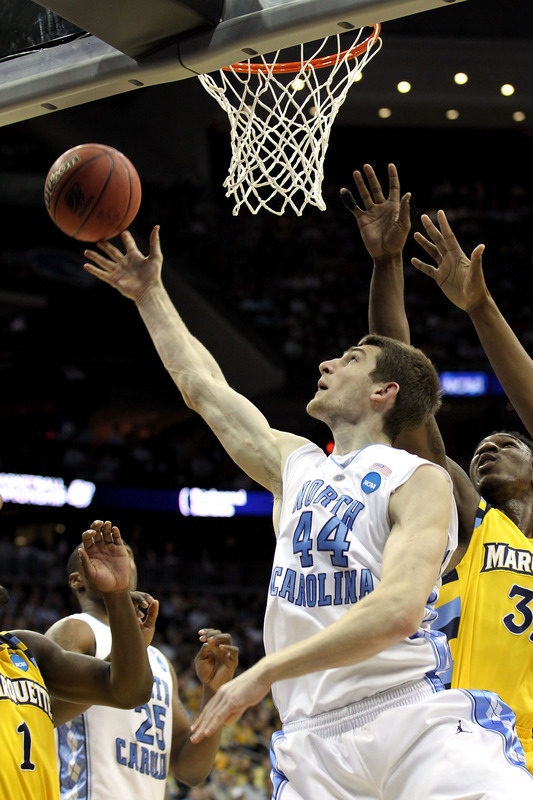 Zeller had 27 points and 15 rebounds, and John Henson added 14 points and 12 rebounds for North Carolina. Harrison Barnes contributed 20 points and six rebounds as the second-seeded Tar Heels (29-7) moved to within a game of reaching the Final Four for the third time in four years. UNC limited No. 11 seed Marquette (22-15) to 15 first-half points while opening a 25-point lead. Those 15 first-half points were the second-fewest allowed by North Carolina in a half in 144 NCAA tournament games, and the Golden Eagles’ 20 percent shooting from the field came on 6-of-30 shooting was the lowest allowed in a half by North Carolina in an NCAA tournament game. Davante Gardner led the Golden Eagles with 16 points and six rebounds. Jimmy Butler added 14 in his final game for a team that three weeks ago looked like it wouldn’t make the tournament after getting blown out by sub .500 Seton Hall in this same building. Unlike the ACC tournament when they had to rally from double-digit deficits, the Tar Heels played a physical game against their tough-minded Big East Conference opponent for the opening eight minutes and then took control. Trailing 10-8 with 12:43 to go, North Carolina went on a 19-0 run, forcing Marquette to miss 14 straight shots. The game was just about over at that point. Kendall Marshall (7 assists) started the North Carolina run with a shot in the lane, and Zeller gave the Tar Heels the lead for good, grabbing two offensive rebounds on the same possession and putting the second one in. Give, Marquette credit, they never gave up, but the hill was too tall to climb.